An artwork created by Paris-based art collective Obvious using artificial intelligence has been sold at Christie's auction house in New York for nearly half a million dollars. I can see how purchasing the first ever piece of AI art at Christies is a sensible investment, but I'm conflicted in the subject matter and treatment which is purposefully emulating real painting techniques. But there again I suppose that is the purpose of the execrcise. It's still a genuine piece of creativity...or is it? 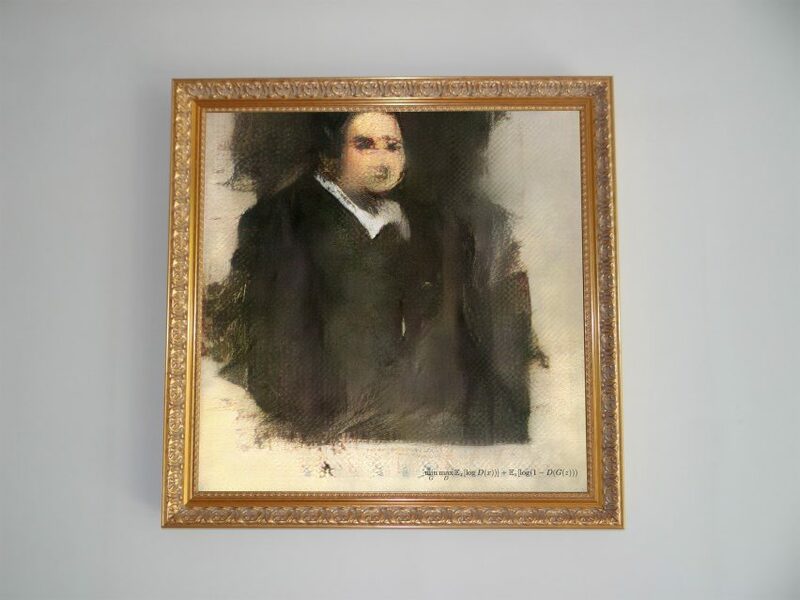 The AI painting, titled Portrait of Edmond de Belamy, sold for for $432,000 (£337,000) – more than 40 times the estimated selling price of $7,000 to $10,000. Christie's became the first auction house to put an artwork generated by an algorithm under the hammer, when the abstract portrait was sold by the company's New York branch. Sold in an original gilded wood frame, the portrait depicts a man dressed in a dark frock coat with a plain white collar showing underneath. The work looks unfinished, with indistinct, blurry facial features and large areas of canvas left blank. The work has been signed with the mathematical formula of the algorithms used to create it. Obvious created the work using the Generative Adversarial Network algorithm (GAN) and information from 15,000 portraits. Comprised of a two-part algorithm – the generator and the discriminator – the system was fed a data set of portraits painted between the 14th and 20th centuries. The generator created new images based on this set, while the discriminator reviewed all outputs, comparing the product of the algorithm with the pieces painted by human hands until it couldn't tell the two apart. Once the computer algorithm had generated the image, this was then printed in ink on canvas. "This new technology allows us to experiment on the notion of creativity for a machine, and the parallel with the role of the artist in the creation process," said Hugo Caselles-Dupré, co-founder of Obvious collective. "The approach invites the observer to consider and evaluate the similarities and distinctions between the mechanics within the human brain, such as the creative process, and the ones of an algorithm," he continued. "We wish to emphasise the parallel between the input parameters used for training an algorithm, and the expertise and influences that craft the style of an artist. Most of all, we want the viewer to focus on the creative process: an algorithm usually functions by replicating human behaviour, but it learns by using a path of its own." The portrait is one of a group of 11 unique portraits of the fictional Belamy family, conceived by Hugo Caselles-Dupré, Pierre Fautrel and Gauthier Vernier who make up the Obvious collective. The series was named after the inventor of GAN Ian Goodfellow, with "good fellow" loosely translating to "bel ami" in French. Known for selling works by some of the most lauded artists in history, Christie's sold the AI artwork as part of the Prints & Multiples auction in New York, which took place from 23 to 25 October. "Christie's continually stays attuned to changes in the art market and how technology can impact the creation and consumption of art," said Richard Lloyd, international head of prints and multiples at Christie's. "AI has already been incorporated as a tool by contemporary artists and as this technology further develops, we are excited to participate in these continued conversations. To best engage in the dialogue, we are offering a public platform to exhibit an artwork that has entirely been realised by an algorithm," he added. "When the Portrait of Edmond de Belamy goes under the hammer in the Prints & Multiples sale, it will signal the arrival of AI art on the world auction stage," he stated before the sale. According to the auction house, proceeds from the sale of the portrait will be used to further the collective's research into training its algorithm and to finance the computation power needed to produce this type of artwork.